A downtown Spokane marijuana retailer isn't being welcomed with open arms by local anti-pot advocates. "Man made beer. God made pot. Who do you trust?" asks a poster that adorns the walls of Lucky Leaf Co., downtown Spokane's only licensed cannabis dispensary. Joking aside, the new business, which opened in March, is facing an ecclesiastical confrontation of its own. "No, not here," read the signs of protestors from the Cathedral of Our Lady of Lourdes, the seat of the Diocese of Spokane. Parishioners congregate on the sidewalk outside of Lucky Leaf, usually multiple times per week, to show their opposition to the store, says Shilo Morgan, who co-owns Lucky Leaf with her husband, David. "I don't want any animosity," she says. "I come from a very Catholic family. My kids went to a Catholic school." In May, representatives of Our Lady of Lourdes met with city leaders and lawmakers to express their displeasure with the new neighbor (Lucky Leaf is down the block and around the corner on First Avenue) and voice concerns regarding the legalization of cannabis downtown. Now they're doubling down. Tim Coyle, a self-described "concerned citizen" affiliated with the church, says he recently co-authored a letter with Reverend Darrin Connall, the church's rector, to the Washington State Liquor and Cannabis Board requesting an investigation into the marijuana shop's proximity to the Riverside-Cedar Parkway, a treed median that abuts the church. 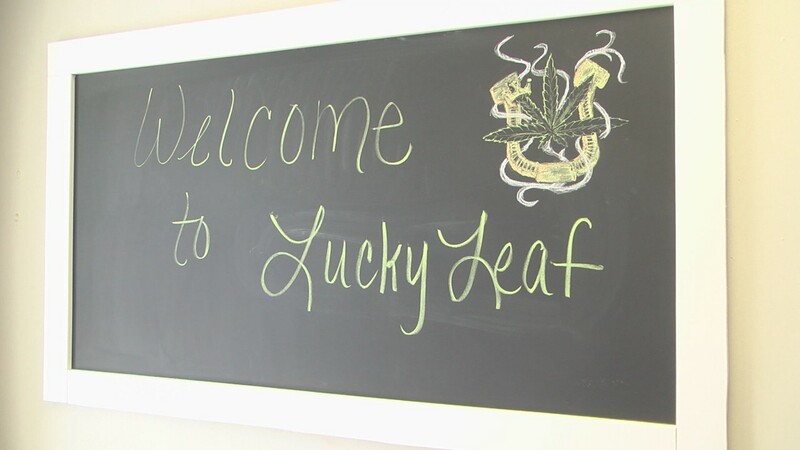 They argue that it is a public park, therefore an entity with a 1,000-foot buffer within which state-licensed marijuana retailers, like Lucky Leaf, cannot operate; Coyle says the Liquor and Cannabis Board has yet to respond. "That thing could not be called a park," says a bemused Morgan. "It's right in the middle of the road." Coyle is also pushing a proposed ordinance to amend Municipal Code and effectively ban commercial marijuana enterprises downtown. He calls it a "common sense issue" about "human dignity and the safety of people," particularly our city's youth. If the motion survives legal scrutiny from the city's hearing examiner, the Spokane City Council will then decide whether or not to submit the measure to popular vote. Without council support, Coyle would have to secure 7,757 signatures to put a related initiative before the voters. City Council President Ben Stuckart says that's unlikely. He suspects a connection between this petition and recent anti-immigrant and anti-"bikini barista" initiatives, "based on who testified about these issues before city council."